Retired from the profession and finding himself eager to give back, today’s guest has partnered with a developer to create an app that helps small firm architects manage their time and money. After a long journey, he’s launching the product he wishes he had when he was the owner of his own small architecture firm. 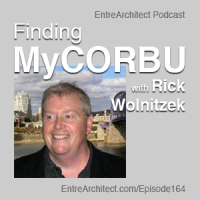 This week on EntreArchitect podcast, Finding MyCORBU with Rick Wolnitzek. Rick Wolnikzek is an architect based in northern Kentucky outside of Cincinnati and the creator of ArchitekWiki, a blog for small firms covering ideas, information, links, procedures, checklists, details and more to help young architects work productively and effectively. He’s also the founder of MyCORBU, a bookkeeping software specifically for architects. In high school, Rick knew he wanted to be an architect. The idea of creating things like tunnels and camps as a kid pushed him toward the idea. He planned to go to the University of Cincinnati, but an influx of in-state applicants foiled his plans. His dad proposed Notre Dame, and in hindsight, his schooling there was a highlight of his career. Following his education, he worked for a small, five-person firm for the next seven years working on schools. There he learned to do a wide array of tasks due to the limited staff. He joined a mentor who had started a new firm, and years in the frustration of not having a ton to do and lack of willingness to try new things ate him up over time. It was there that Rick made a trade that if his partner would go get their coffee across the street, Rick would manage the books. Rick eventually decided to go out on his own in Cincinnati, and he found that he didn’t have as much of a stature that he wanted. Suddenly, he had a client who needed an office building and then a connection for another project. He had always done back-office things well, but struggled with doing business development. In 30 years, Rick’s firm fluctuated between two and twelve people. Toward the end of the road, Rick let go of most of his employees and was writing checks to keep the firm afloat. He decided to work from home, and struck a deal with his landlord to get out of the lease early in exchange for some office furniture. Eight months later, he realized he had actually retired. He thought, “Maybe I could make a living selling things to help other architects.” Soon after he launched ArchitekWiki. For the first year, Rick wrote a post every few days to share his experiences. He wanted to go back to the tools he’d developed over his career and put them into a format that might be useful to other architects, such as a how-to on Trello for project management, a calculation tool, and more. Two years into his retirement, he was out of the software that he’d used when he was practicing architecture. Rick was using a time-keeping software that he liked, but he was constantly trying to improve it for the use of architects. Eventually, the developer met with Rick to ask him to help develop something specifically for architects. He interviewed about 75 architects and surveyed 1500 firms over six months, and they learned that there wasn’t a great way for architects to invoice. Although their dreams were big, they encountered a lot of difficulties of how to actually develop a program for invoicing. By the end of the year, the partnership was nickel-and-diming back and forth, and a lot of the fun was taken out of the project. At that point, Rick stepped away and they began the dismantling process to move away from the work they’d done. After some time away, Rick stepped back to the table. He thought he could fund development to finally build this dream app. Rick projected the project to take a year and cost around $500K. He researched investors, kick starters, and more, getting nowhere. He stumbled upon an app builder called Knack that worked on any platform with databases and was only $39/month for the software. He decided to give it a shot. Only a month later, Rick had a rudimentary version working and a website in the works. He’s developed help articles, figured out how to price it and how the pricing would work, and more. It got to the point where he didn’t realize that the way he was going about it from the point of how it worked was the easy part. The side of setting clients up with an account was much trickier. Finally, they found a way for clients to jump on board, sign up and be set to go. Coming later is a paid version that will include other features! Rick also hopes to add a bookkeeping element at some point, and perhaps an invoicing version. Connect with Rick online via ArchitekWiki or MyCORBU. You can also find him on LinkedIn, Twitter and Facebook. ARCAT has huge libraries of free content, Specs, CAD, BIM and more. No registration required. Visit EntreArchitect.com/ARCAT for more information.